Xander and I had our trip to Fenway today, with my first time ever sitting on the Green Monster. The weather was great (low 80s, partly cloudy, with a nice breeze), the seats were excellent (Section 5, Row 1, Seats 9 and 10 — basically middle of the front row), and the Sox scored six runs in the bottom of the 1st on their way to an 8-4 win. I’ll probably say more about this later, but in the meantime I finally have a picture to upload here. The guy sitting next to us had an iPhone and was kind enough to take this photo and email it to me. 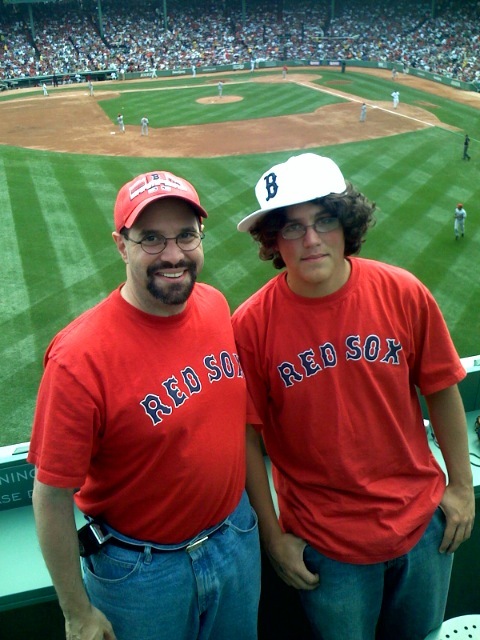 Everything would have been perfect, but when we got home we saw the Sox go ahead 5-4 in the 8th inning of the nightcap, only to see Erik Gagne blow the save in the top of the 9th. Oh well. With the Yankees win today, the lead is back to 5 games.